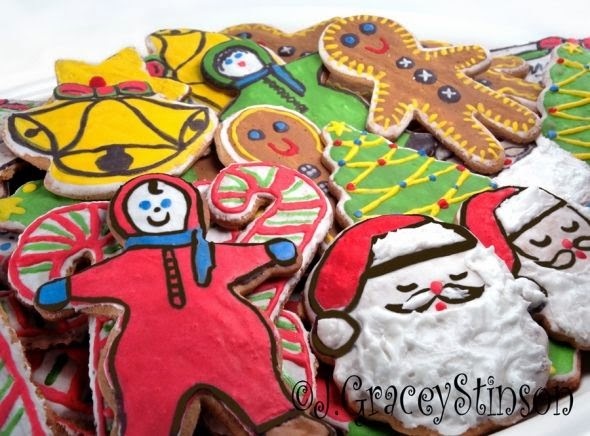 Traditional decorated Christmas cookies - a labour of love, and fun for all ages. 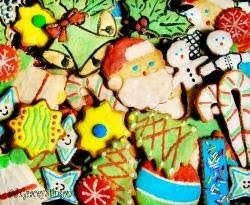 The cookie itself is easy - a basic sugar cookie recipe, rolled and cutout with any shape cookie-cutter (of course, at Christmas, I use Christmas shapes). The decorating takes time; lots of it, so start these well in advance of when you need them. 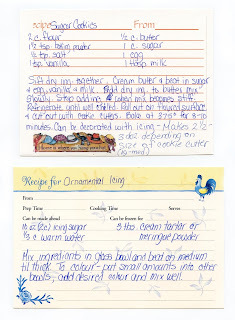 You'll need two recipes for this cookie (found below in a printable image format) and the cookies can be made well in advance and frozen until you are ready to begin decorating. Kids love these (as do a lot of adults), and if you really want to take the extra step you can punch a hole in the top before baking to turn them into an edible decoration - a dessert tree if you like. Grab some bare branches, let them dry, spray paint and glitter them and hang your cookie creations for a unique Christmas decor item that changes every year. Painted Christmas Cookies The cookies are pretty basic – make up the dough following the recipe. I usually double the recipe, cut the dough ball into four pieces and roll it into tube-shaped chunks which I wrap in wax paper and put in the fridge for about half an hour. I work with one dough chunk at a time (leaving the others in the fridge). Roll out the dough on a well floured surface (a marble rolling pin stuck in the fridge or freezer to cool it helps keep the dough from sticking to the pin) until it is between 1/8? and 1/4? thick. You don’t want it too thin as it’s hard to handle and will break, and you don’t want it too thick, otherwise they’ll be hard to eat (these cookies are not soft when baked). Bake according to instructions and stack in large cookie tins lined with wax paper after the cookies cool. Freeze if you aren’t going to work on the decorating right away. 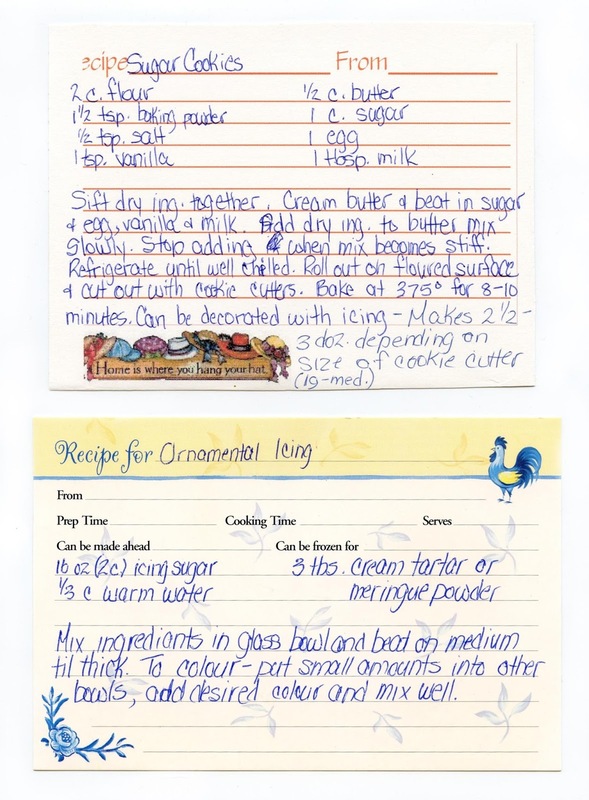 The icing recipe is basic too, BUT – in order to use it to “paint” the cookies, you’ll need to thin it out after making it. Use water for that, and do it when you are mixing up the colours for the frosting. And yes, to paint these, you need paint brushes – the art kind. You’ll need to find brushes that will not lose their bristles in water – cheaper brushes leave brush bristles in the icing, and you don’t want that. 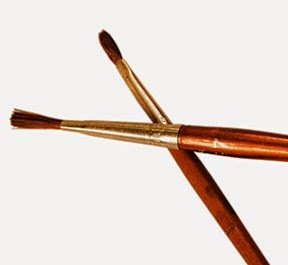 Find brushes designed for use with water-colour paints or water-based paint. Get a variety of sizes (tiny narrow tips for details, larger ones for base painting). Once you’ve got a decent set of brushes, store them with your cookie cutters and use the same brushes every year (never use your brushes for paint!). The best food colouring is the type used by cake decorators - bottled in a set of 8 or more colours. With this you can mix any colour, and use less of this than the liquid type. The reds are red, the black is black. Once the icing is mixed, it needs to be kept covered. I separate equal amounts of icing into smaller containers (usually I keep the containers from ready-made jello or pudding cups to use) – I usually end up with 10 or 12 small containers of icing. I cover each one with a damp paper towel, then cover tightly with plastic wrap and an elastic band. Colours are added to the individual cups as I need them. I start with a plain white icing cup and lightly “paint” all of the cookies. This is the “base coat”. Depending on how many cookies you’ve made, and how thick you make the base coat (I tend to make it so when it’s dry, it looks sort of like a thick glaze, and you can just see that it’s white) you will probably need to set the cookies aside to dry until the next day. By the time you base coat 15 dozen cookies (about what I usually make) you’re pooped. I’ve made these cookies since my kids were babies (over 35 years I guess), and I’m not going to hide the fact that these are WORK if you do them in large batches. Besides being put onto the dessert trays at parties and dinner, these have always been included in the thirty or so gift boxes of home baked goods we distribute to our neighbours and store clerks at Christmas (which is why I make so many). The first year that I decided not to make them was the year my husband had his second heart surgery – a sudden one that happened right before Christmas (Dec. 15). I spent more than a week in a different city in a hotel during that time, and when I got home I certainly didn’t have two weeks to shop (none of the Christmas shopping was done), decorate (didn’t have any Christmas decorations up at that point either), and bake. These cookies take the longest of all the ones I make, so decided to drop them off the list due to a time shortage. When I mentioned this to my grown daughters they were flabbergasted, and loudly protested the lack of “their” Christmas cookies. This had become such an expected cookie at Christmas that they simply wouldn’t go without it. I ended up making them, but a much smaller batch than normal that took many sleepless nights to complete. Last year, I invited my grandchildren to help with the decorating. Well … that was very messy (5 kids, and my 2 adult girls helping) but also a lot of fun for everyone. Sadly, there were very few of those that could be put into the gift boxes, but the grandkids absolutely loved their own creations and couldn’t wait to eat them. Even my daughter … who decided that to avoid having someone else eat HER cookies she’d sign her name on the back! 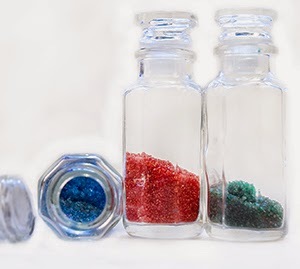 Last year I also purchased a number of different “sprinkle on” type decorations for the kids to use: an array of coloured sugar crystals in all colours; tiny gingerbread-man confetti; red, white and green “sprinkles”; small circular confetti in Christmas colours, as well as confetti that looked like holly leaves and berries, and some that were shaped like snowflakes. Other purchased item included “icing eyes” for gingerbread cookies and snowmen; finely chopped coconut that we mixed with white decorator sugar crystals and chopped white sprinkles (use a small coffee bean grinder or nut grinder) made the snowmen, as well as Santa’s beard textured and “frosty” looking; mini “m & m” candy worked for buttons too. Check your nearest bulk store for whatever they’ve got that suits the occasion and buy a small spoonful or two.